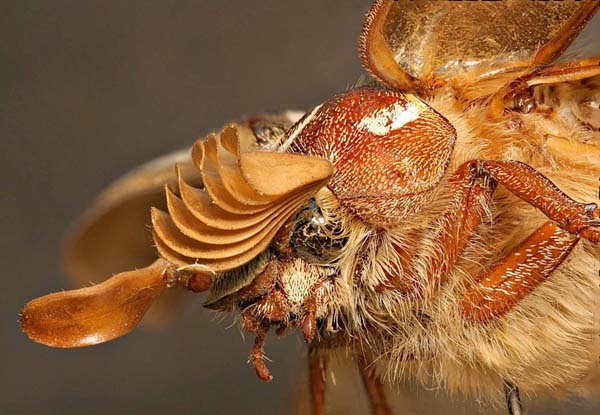 Focus stacking software continues to improve and proliferate. At present, my personal favorite is a new program, Zerene Stacker 1.0. It offers uniquely good automatic handling of tough "extreme macro" problems, such as bristles and low contrast subjects shot in deep stacks. At the same time, it's easy to use, its retouching capabilities are first-rate, and it works just fine on simpler problems too. That's why my links page describes it as "better images, less work". As of this writing [now over 4 years ago], recent updates to two easily used software packages make most of this page "overcome by events". That is a Good Thing! Be sure to check them out: Helicon Focus 3.00 and CombineZ5. See also John Hollenberg's review of these packages. The discussion below includes some work using earlier versions of these packages. The new versions are much improved. For most subjects, both packages can now produce better results with a lot less work than using Panorama Tools. Most readers should think of this page as providing historical perspective and possibly some interesting test cases and discussion. This apparently fearsome beast is just a common Ten-Lined June Beetle. You can search Google for pictures and stories about the insect. An extended-depth-of-field capability has been incorporated into recent versions of the open-source Panorama Tools library "pano12.dll". This capability works much like commercially available extended depth-of-field software. It automatically determines, for every point in the picture, which of numerous overlapping images is focused the best. Then it generates masks that select only the best focused image areas to be visible in the final picture. 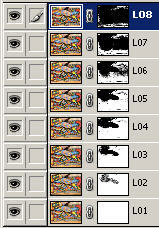 The images produced by this pano12.dll are similar to those produced by other extended-depth-of-field software, but can be easier to edit because the visibility masks can be preserved in the output. In addition, Panorama Tools and related software are extremely good at adjusting individual input images' scale and position so that the finest details are properly aligned across the whole sequence of input images. This alignment contributes a great deal to the high quality assembly illustrated above. Compiled and zipped pano12.dll for Windows. This is Jim Watters' 2.7.0.5 build from 09/27/2004. The base code is from http://sourceforge.net/projects/panotools/, version 2.7.0.3. Current code from sourceforge will already incorporate the above modified sources. 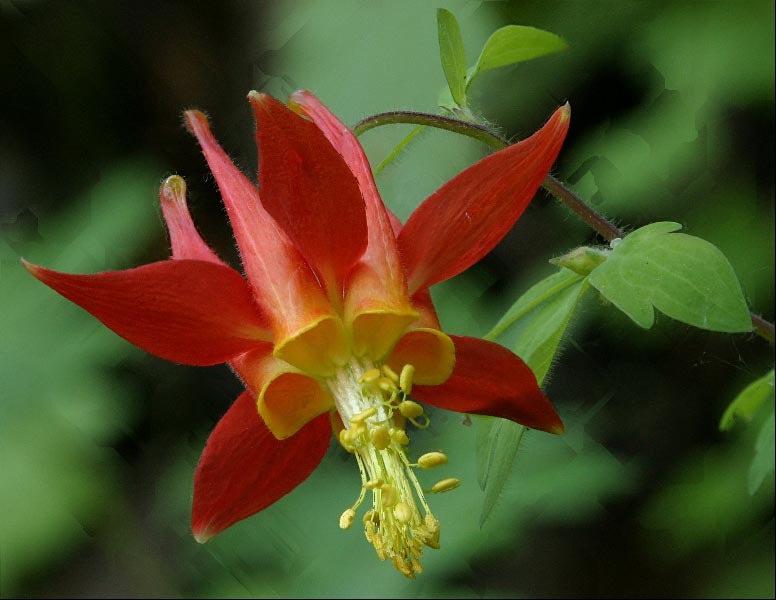 Source images and software outputs for the columbine flower example below are contained in: ColumbineDemoProject.zip (3MB). Members of the Yahoo PanoTools group should check that group's Files area at http://groups.yahoo.com/group/PanoTools/files/PanoTools/ for updated binaries. Note: the extended depth-of-field capability contains known problems as documented below. Please read those before using. p w825 h558 f0 v50 u2 n"PSD_mask"
fN focus estimation window size, N = halfwidth of window. Recommended value is 0.5% of image width, e.g. 4 pixels for an 800-pixel image. Computation cost for focus estimation increases proportional to N^2. Default f4. sN smoothing window size, N = halfwidth of window. Computation cost for smoothing increases proportional to N^2. Default s4. Extended depth-of-field is computed whenever feathering is selected and the "z" line is present. 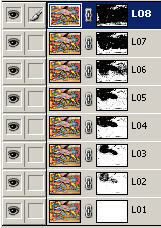 The computed masks are present in "Photoshop with feather" (PSD_mask) and "Multi-image feathered TIFF" (TIFF_mask) outputs. The effects of the masks are shown in all single-image output, such as TIFF and JPEG. In PTGui, the results are visible in a Preview image, but not in the Panorama Editor window. This code uses the classical variance method of estimating focus. An array of "best source" image numbers is computed, recording at each pixel position the PTStitcher image number that has the largest variance of pixel values within a focus-estimation window. Then masks are computed as follows. For mask type m0, at each pixel, the mask value is 255 for the best image and 0 for all others. For mask type m1, at each pixel, the mask value is 255 for the best image and all lower-numbered images, and 0 for all higher-numbered images. For mask type m2, the array of "best source" image numbers is smoothed by a simple averaging filter. Then at each pixel position, the mask value is computed as 255 if the image number is less than or equal to the average, 0 if the image number is greater than the average+1, and linearly interpolated between 255 and 0 as the image number is between average and average+1. I make no claim that this is a particularly good way to do the job, but it was quick to get working and generates perhaps surprisingly good results. 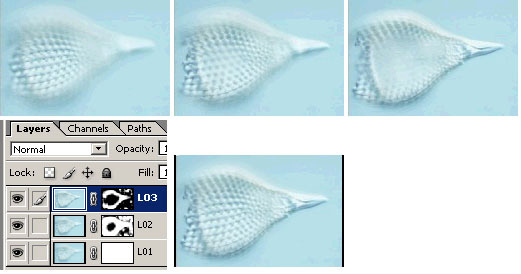 Here are three microscopy images, the computed masks, and the composite image, created with default parameters. The source images were downloaded from http://bigwww.epfl.ch/demo/edf/ . For comparison, the following results are computed without masks, using an algorithm based on complex wavelets, as described at http://bigwww.epfl.ch/demo/edf/ and http://user.cs.tu-berlin.de/~nowozin/waveblend/ respectively. The preceding two examples seem to be relatively "easy", in the sense that all software tested so far on them does pretty well. A more challenging example is presented by the lovely Columbine flower photographed by Karl Gohl. Karl's original montage, viewable at http://www.pbase.com/image/28622076/large, was generated entirely by manual editing of masks in a Photoshop stack, as he describes at http://www.tawbaware.com/forum2/viewtopic.php?t=759 . The seven source images for this montage cannot be registered as perfectly as in our first two examples. Due to natural movement of the flower stem, the flower rotates slightly between shots and also shifts across the background. Here are all seven frames, before and after registration, animated as a film loop. 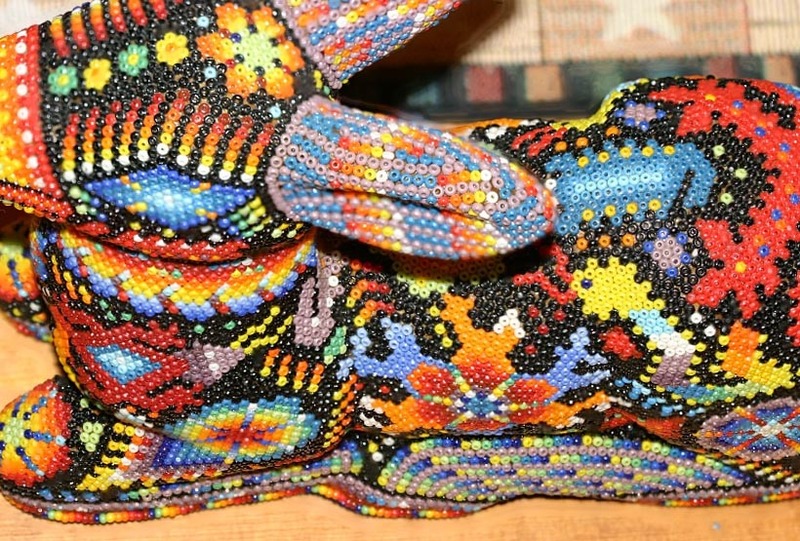 Much of the image is background, which is not well focused in any frame. Thus, in much of the image, an algorithm has essentially no information conveniently available to tell it which frame to select. To attack this problem, I created a PTGui project containing the original 7 full-size images. I defined control points and optimized pitch/roll/yaw/fov to register visible details in the flower and its leaves as well as possible between frames. Then, based on visual inspection of the images, I decided to place the backmost image at the top of the Photoshop stack, because I anticipated having to do the most painting in that mask. 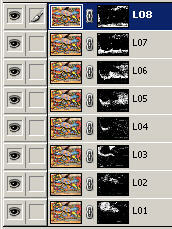 To accomplish that, I re-ordered the source images in the PTGui project to be in front-to-back order. (This is because pano12.dll constructs the Photoshop stack from bottom to top.) Then I rendered, using PTGui's "show script" option to insert the "z" line into the PTStitcher script. Quite frankly, I was surprised at how well the current simple algorithm handled this problem. Coming straight out of the algorithm, the flower looked pretty good. The background, as expected, was sort of randomly selected from various images based on noise in the original images. However, that aspect was easily cleaned up by painting white in the background image's mask -- the top one in the Photoshop stack. These test images and outputs can be downloaded here: ColumbineDemoProject.zip (3MB). 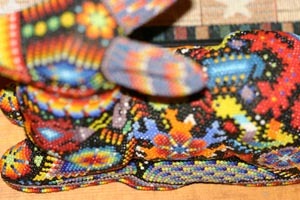 Mottled background, some softness in the image, particularly in the transition between backmost two images. CombineZ, using default parameters and the single command Special | Do Combine. Hard edged streaky artifacts in background, doubled edges along some petals and throughout the yellow stamens. I don't know how to adjust the parameters on CombineZ to make this better. Suggestions, anyone? Syncroscopy Auto_Montage Essentials version 5.01.0006 ES DEMO (Scan Montage, Method: Fixed, Patch Size: 10). Mottled background, otherwise quite good -- crisp rendering and correct selection of source images..
Helicon Focus 2.03 Lite contrast estimation radius 10, smoothing 4, background dim-out 0. Extremely good automated result. With these parameters, image suffers only from a slight smoothness, visible for example in the stem hairs. With smoothing=0 (not shown), image details are crisp but background goes mottled. This experimental pano12.dll, after editing just the topmost Photoshop mask. Smooth background (due to mask editing), some softness in areas that fall "between" two images. What I see here is a spectrum of capabilities and costs, with no single perfect solution. Aside from the slight smoothness, the Helicon Focus image is extraordinary. However, this tool has no image registration or image editing capabilities of its own. Syncroscopy Auto-Montage has both, but it is rather expensive and the editing function is sluggish for large images. CombineZ is extremely easy to use -- four mouseclicks to align and combine all the images -- but for this example, its output image is significantly lower quality than the others. The experimental pano12 is still a bit clunky, but its output image and editable format has some attraction if you are going for highest quality. And of course, it's free. Your mileage may vary. I am not expert with any of these codes, including my own. Suggestions for improvement will be appreciated. This is a more recent example, designed to see how this Panorama Tools technology behaves when pushed. The June Beetle was imaged using a Canon Digital Rebel camera with a Sigma 100 mm macro lens at 1:1, f/11. 55 input frames were captured at size 3072x2048 pixels, stepping the subject-to-lens distance by 0.010 inches in depth to guarantee that every point was well focused in some image. (This increment was smaller than necessary. Stepping by 0.030 inches would have yielded almost the same quality.) These 55 input frames were entered into a PTGui project (version 3.7beta1, from http://www.ptgui.com). Control points were generated automatically using autopano_v103 (http://www.le-geo.com/kolor/autopano/), invoked from PTGui. A couple of iterations were performed, using PTGui optimization for fov/pitch/yaw/roll and the APClean utility (http://www.fsoft.it/panorama/APClean.htm) to remove out-of-concensus control points, eventually leaving in place 3042 control points with an rms error of 0.06% of image width (1.95 pixels out of 3072). An extended-depth-of-field output image was rendered direct to JPEG using "z s7 f7" at 3072x2048 pixels. In this application, it would not have been effective to have Panorama Tools generate a .psd file including masks, because the large image size and large number of input images would have produced an unmanageably large .psd file. It was much more practical to let Panorama Tools generate a single flattened extended-depth-of-field image, then do the minor editing one image at a time. For comparison purposes, I also tried running the June Beetle example through Helicon Focus to compute the extended-depth-of-field image from the registered "Multi-image TIFF" files generated by Panorama Tools. As with the Columbine flower example discussed above, the Helicon Focus output was very good other than some overall softness that I could not eliminate without introducing visibility defects. It seems again that the tradeoff is between highest final quality and ease of use. For routine use, an attractive workflow is to use Panorama Tools to generate properly registered intermediate images, and feed those to Helicon Focus for extended-depth-of-field assembly. 2. This version correctly handles only those areas of the picture that are covered by all images. If any image does not cover some area of the picture, then incorrect masks are likely to be computed in that area, particularly if blended masks option m2 (default) is used. It is not immediately clear how to remove this restriction, due to difficulty defining a smoothing algorithm that is both correct and useful even around image edges. 3. No support for 16-bit images -- will not work properly and will not diagnose the problem. 5. No support for smoothed masks except with m2 (stacked blended masks). For example there is no concept of exclusive masks with soft edges, equivalent to painting masks in Photoshop with a soft-edged brush. 6. Does not work if the Panorama Tools options for color and/or brightness correction are selected. Be sure to disable these corrections in your GUI. If you need these corrections, make them in a separate step to generate new image files, then use the corrected files as input to the extended depth-of-field code. 7. The current version of autopano (v103) sometimes generates incorrect control points for images that contain out-of-focus regions. This problem is being investigated. I would like to hear feedback about this work. Please let me know of any successes, failures, problems, or other comments. Here is current information on how to reach me. Page last modified November 25, 2009. Page modification April 20, 2005. Previous major revision October 23, 2004.